Greetings and welcome to the Kansas City Southern Fourth Quarter and Full Year 2018 Earnings Call. At this time, all participants will be in a listen-only mode. A brief question-and-answer session will follow the formal presentation. (Operator Instructions) As a reminder, this conference is being recorded. This presentation includes statements concerning potential future events involving the company which could materially differ from the events that actually occur. The differences could be caused by a number of factors, including those factors identified in the Risk Factors section of the company's Form 10-K for the year-ended December 31, 2018, filed with the SEC. The company is not obligated to update any forward-looking statements in this presentation to reflect future events or developments. All reconciliations to GAAP can be found on the KCS website, www.kcsouthern.com. It is now my pleasure to introduce your host, Pat Ottensmeyer, President and Chief Executive Officer for Kansas City Southern. Mr. Ottensmeyer, you may begin. Okay. Thank you. Good morning, everyone, and happy New Year. We'll start on Slide 5 -- 4, I'm sorry , with the presenters and you'll see one change in our lineup this quarter. Mike Naatz is going to be speaking to the sales and marketing and revenue side of the business in the presentation. We will have Jose Zozaya on the phone in Mexico and Brian Hancock is here in the room with this for Q&A. Moving to Slide 5, fourth quarter results. Revenue increased 5% to a record for the fourth quarter, $694 million, led by strength in crude oil and refined products into Mexico. Volumes were flat from the previous year. Fourth quarter operating ratio is 63.1%, adjusted operating ratio of 64.3%. Mike Upchurch will get into details about the adjustment, but basically as it relates to insurance recoveries from the Hurricane Harvey flooding in 2017. Fourth quarter earnings per share of $1.59, adjusted earnings per share of $1.56, which was a record for the fourth quarter and 13% improvement over last year. Slide 6, we talk about the full-year results. Revenue increased 5% from 2017 to a record $2,714 million, 2% volume growth. Full year operating ratio reported of 63.7%. Again, the adjustment takes that 64.3 with the adjustment, primarily being the insurance recoveries that I mentioned a minute ago. Full year EPS of $6.13 adjusted to 597 which was also a record and a 14% increase from 2017. Slide 7, probably the most interesting slide in the presentation today. We have finished our full year 2019 plan and long-range plan update, and keeping with our commitment that we made in November of sharing being a little more forthcoming with guidance. This is where we ended up when we finished our planning process. For 2019, we're looking at volume growth in the 3% to 4% range. Revenue growth of 5% to 7% for 2019 and we're putting a longer-term operating ratio target out there of 60% to 61% by 2021. Jeff will talk more about that. You mentioned and we saw in the press release, we mentioned a heightened focus on operational excellence and operational performance, and implementation of some of the principles of precision schedule railroading. Jeff will get into that in more detail in a few minutes. I'll just say that we are in a very early stages of our works and understanding how PSR principles will apply and we will probably not be completing in terms of answering some questions about timing and magnitude of some of the details. Again, we're very early in our thinking here. So, further guidance here, earnings per share over the next three years, low to mid-teen compound annual growth rate in EPS and CapEx for 2019, we're looking at the $640 million to $660 million range -- $660 million, which includes some locomotive purchases that we've talked about in previous reports. And then beyond 2019, we are looking to CapEx migrating down to something in the high teens, but below 20%. So with that, I will turn the presentation over to Jeff. Thanks, Pat and good morning. Starting with review of operating metrics for the quarter on Slide 9. Overall dwell and velocity showed general improvement over Q3. Peak third quarter congestion eased in December and January, year-to-date metrics continue to show improvement. Coming out of our normal holiday slowdown period, last week's reported dwell has returned to normal levels at 22.5 hours. Expanding on the current state of operations, on Slide 10, other key metrics showing substantial improvement or the terminal performance at Monterrey and Sanchez. Inventory and dwell at these terminals have significantly improved since peak levels in the third quarter. We continue to work with customers to rightsize equipment and optimize service in this region. Cross border initiatives continue to support fluidity in the region and Q4 was another strong quarter for cross border volume that increased by 16%. We continue to progress our international crew initiatives and are seeing a reduction in overall transit time across the bridge as more trains operate with this crew base. Turning to Slide 11. I will provide a quick update on capital spend, 2018 capital was 19% of revenue or 5% below guidance. Reductions attributed primarily to cost savings and PTC and other capacity projects coming in the low budget. Highlights for 2019 capital include continued investment in cross-border line of road capacity and infrastructure improvements to support the growth in this region. Segments between Houston and the border as well as Monterrey to Matamoros continue to be a priority to support strong cross-border demand and new refined products terminal coming online in Houston and gulf regions. Additionally, we are on track to receive the first of 50 new high horsepower locomotives units late in January. As mentioned last quarter, we are selling 33 lower horsepower units as part of this transaction. I will provide additional color on our locomotive fleet momentarily. Turning to Slide 12. I would like to provide some insight into our plans for PSR. Entering 2019, we are focused on implementing the PSR operating principles that are most relevant to our network. To assist in this process, we have entered into a consulting agreement with Sameh Fahmy. Mr. Fahmy is a former Canadian National Executive with 27 years of experience at CN, 12 of those years spent working as part of Hunter Harrison's Executive Management Team. In addition to his experience with CN, Mr. Fahmy has done work with other railroads in similar PSR roles. He also brings a wealth of locomotive knowledge as he worked with GE for 3 years. Initial areas of focus include improved labor and asset utilization, train start rationalization and fueling efficiency among several others. Mr. Fahmy's compensation structure is in line with that of our executive management team and we are all working toward shared financial goals. Providing some real-life examples of recent initiatives, we have redesigned our intermodal and manifest product between Kansas City and St. Louis and have reduced eight train starts per week in this segment. Initial rationalization of our Mexico network has provided an additional 28 train start per week production. Combined, these two initiatives will save over $2 million per year and labor cost alone in addition to locomotive fuel and equipment savings. Turning back to our locomotive strategy, PSR initiatives will allow us to reduce the overall locomotive fleet. While we have not identified a total number for reduction at this time as compared to the peak number of active locomotives in 2018, we have returned 25 leased units and are in process of storing an additional 20 units. Acquisition of the 50 new units is in line with another of our PSR initiatives of reducing locomotive failures. New reliable units will allow for increased fleet utilization by reducing unplanned failures. At the same time this acquisition provides additional high horsepower units to support the growth in our refined products unit train segment. We will continue to target other yard local and poor performing road units for disposition. Nothing about our network should prevent implementing parts of PSR that will help drive efficiencies and we will continue to work closely with interchange partners who are also at work on PSR initiatives. In the end, we look to see more efficient interchanges from overall rail network improvements. I will now turn the presentation over to Mike Naatz. Thank you, Jeff and good morning everyone. I'll start my comments on Page 14, you'll see the fourth quarter year-over-year revenue was up 5% on flat volumes, if you were to look at the appendix, you see full year revenue and volume growth, we're at 5% and 2% respectively. 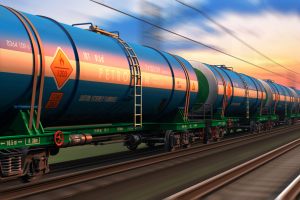 In the fourth quarter, we continue to see strong growth in cross-border carloads and revenue, most notably from refined products and cross border intermodal business. However, as Jeff discussed during the first half of Q4, we were challenged by congestion in Northern Mexico and this did have an impact on our business. During the quarter, our revenue per unit grew consistently with what we experienced in Q3, despite mixed pressure from the lots of some long haul utility coal business and unfavorable FX. Core pricing environment remained healthy and we expect pricing to outpace inflation. The Chemical and petroleum business unit recorded revenue growth of 19%. This growth was primarily driven by strong southbound volumes of refined fuel products moving into Mexico. For the full year, the Mexican energy reform business contributed nearly $100 million of revenue with carloads and revenue growing at 156% and 120% respectively. We included a full year recap on this topic in the appendix. It's also worth mentioning that plastics grew at 14%. Revenue from our industrial and consumer business unit was down 5% year-over-year. This decrease was primarily attributable to timing of military moves, a shift in a customer sourcing location within our metals business, which in turn significantly reduce the length of haul on those moves and then the previously mentioned congestion at the border. Revenue in our Ag and Min business grew at 8% in the fourth quarter. This growth was driven primarily by our grain business due to improvements in cycle times and we did see positive pricing gain. The Energy units revenue decline of 7% was driven by a previously announced closure of a power generation facility in Texas and by continuing declines in frac sand. These declines were partially offset by higher volume and pricing in our crude oil business, driven largely by Canadian crude shipments. Intermodal revenue increased slightly year-over-year with mixed performance by lane. The cross-border franchise revenue growth was solid at 8%, driven by truck-to-rail conversions. Other domestic lanes were challenged by congestion and tougher year-over-year comps. Additionally, while Lazaro Intermodal volumes declined 5% year-over-year, we did see meaningful sequential improvement in this lane, driven by our actions taken to restore Lazaro Cardenas volumes. Revenue from the Automotive business was down slightly over the prior year, border congestion, unplanned plant shutdowns and continued equipment availability issues in North America impacted this business unit. Now, I'd now like to move on to Slide 15, where we provide a business segment outlook for 2019. As Pat mentioned, our full-year volume outlook is approximately 3% to 4% with a 5% to 7% year-over-year revenue growth projection. Starting with the Chemical and Petroleum business, the Mexico energy reform continues to be a significant focus and unique opportunity for KCS. We expect volume growth from refined products to continue next year as demand increases and storage capacity comes online. We expect plastics to grow in 2019 with increased demand. Additionally, heavy fuel oil shipments in Mexico are also expected to grow along with higher production. We expect to see solid performance in the automotive business, even though certain plant closures were unexpectedly elongated following the holidays. We expect volume to grow slightly ahead of most third-party estimates for Mexico production. In addition to increasing production in Mexico, volume growth may benefit from market share gains using congestion and additional equipment. We expect to see continued, but moderated growth in our Intermodal business. Our Cross-border and US domestic business has started slowly, but we expect to benefit from truck-to-rail conversions, tight truck capacity and expanded capacity at some key Intermodal terminals. As mentioned earlier, we expect to see positive sequential trends in our Lazaro business as additional trucking regulations are implemented in Mexico and as our customers continue to evaluate and take advantage of our short-term volume-based pricing strategy. However, we are taking a pragmatic approach to the business, focusing on strong service product and rational pricing. We believe that this focus will help us deliver future volume growth that is both sustainable and in the best interest of our customers and shareholders. As for Energy, our coal business should grow with higher natural gas prices and increased demand in the Texas market. On the crude side of things, we are monitoring developments around mandatory production cuts by the Canadian government and the corresponding potential implications on our Canadian crude business. Additionally, we expect continued declines in frac sand due to sourcing pattern changes. And lastly, our outlook for Industrial and Consumer and the Ag and Min business, is neutral to slightly positive, although our metals business should improve in 2019 due to capacity expansions and improved cycle times. We are watching the impact of changes to the global trading patterns and tariffs very closely. And with that, I'll turn things over to CFO, Mike Upchurch. Thanks, Mike, and good morning everyone. Let me start my remarks with a summary overview of fourth quarter 2018 results. Revenues of $694 million were up 5% primarily due to higher fuel surcharge revenues. Reported operating ratio improved to 63.1% predominantly due to an $8.5 million insurance recovery related to Hurricane Harvey. On an adjusted basis, excluding the positive impact from the insurance recovery, our operating ratio was 64.3%, slightly worse than 2017. Reported diluted earnings per share for the fourth quarter of 2018 was $1.59, down from $5.33 in the fourth quarter of 2017, due to the one-time benefits we recorded as a result of tax reform. Adjusted diluted earnings per share of $1.56 was 13% better than fourth quarter 2017. Our adjusted effective tax rate for the fourth quarter of 2018 was 28.3% and for the full year 2018, 28.9% in line with our guidance of 29%. For 2019 through 2021, we are estimating an adjusted effective tax rate of 29% to 30%. And from a cash tax standpoint, we would expect 2019 to be approximately 17% and for 2020 and 2021, 23% and you'll find more details on our tax rates that have been included in the appendix on Page 31. Turning to operating expenses, operating expenses in the quarter adjusted for the insurance recovery from our Hurricane Harvey claim increased 6%. Depreciation expense increased $10 million, a result of in-servicing PTC assets and from a general increase in our asset base. Fuel prices increased both in the US and in Mexico, driving up fuel expense by $10 million. Equipment costs were down $6 million, driven by lower lease payments from owning more of our equipment and lower car hire. Purchased services were up $4 million due to slightly higher IT joint facility dredging and security costs. We also experienced higher personal injury costs in the quarter due to changes in estimates from an actuarial study and experienced a large derailment early in the quarter in Mexico. Wage and benefit inflation and higher headcount of $4 million and $3 million respectively, was partially offset by lower incentive compensation costs of $3 million. Finally, FX lowered overall expense by $5 million. I'd also like to provide you a few thoughts around 2019 expense levels. First, we expect compensation and benefits to increase about 5% due to wage and benefit inflation and slightly higher headcount. But as Jeff mentioned earlier, we also expect to produce labor efficiencies based on our early PSR work. Excluding the credit for insurance settlement contained in materials and other, we would expect to MNO expense and purchased services have normal inflationary type expense increases in 2019. We've also included estimated fuel prices for 2019 in the appendix on Slide 25 and we currently believe fuel prices will moderate in the U.S., but increase in Mexico. And we do expect to continue to be eligible for the fuel excise tax credit in 2019, which we estimate to be $35 million to $40 million. We expect our equipment expenses to be down slightly as a result of owning more of our equipment and from better cycle times. Depreciation is expected to increase approximately 9% and is inclusive of PTC depreciation headwinds of $13 million. In total, we will see PTC expense increases of approximately $17 million for the full year 2019. Finally, let me cover some of our capital structure and capital allocation priorities. As Jeff mentioned earlier, CapEx of $512 million for 2018, did come in substantially below our original and revised third quarter guidance. We will continue to ensure capital spend in a prudent manner to support our growth, while 2019 capital will increase due to purchasing 50 new locomotives. We would expect capital expenditures to decline both in 2020 and 2021 to level slightly below 20% of revenue. We continue to repurchase our stock under the $800 million stock repurchase plan approved by our Board in August of 2017. In the quarter, we repurchased $80 million of our common stock, which was approximately 50% ahead of our prior quarterly pace. Cumulatively, we have now repurchased approximately $1 billion of our stock. And finally in October, S&P recognized our improvement in the capital structure and upgraded our credit rating to BBB flat. And with that, I'll turn the call back to Pat. Okay, since that maybe a record in terms of finishing our formal comments, I'll just make a couple of closing remarks before we open it up to questions. I'll refer to the statement quote, actually in the press release about the results, the quarter, the year, obviously not a not a bad quarter, not a bad year and record performance in a number of levels. But as I said in the press release, while we delivered record revenues adjusted operating income and adjusted EPS, 2018 did not meet our own expectations for financial and operational performance. In addition, we did not meet the expectations of our customers or shareowners, particularly in the areas of customer service and growth. So while we feel good about the performance and we know we're not altogether pleased because we know we could have done better. The key points, I think from the presentation, and happy to get into the Q&A. The service recovery, particularly around the border where we've experienced the worst congestion over the past few few quarters is well under way and we feel good about the performance of the railroad as we head into the new year. The growth opportunities, the over-sized growth opportunities that we've been talking about for several -- of the last few quarters are real and we feel that we've got pretty good transparency on a number of those opportunities and still feel very positive about the growth outlook. And the precision railroading initiative, I think, is off to a good start. I've been very pleased with the engagement of the team, both in the U.S. and Mexico. And with the help of Sameh, I think we can prioritize some things that will give us some pretty quick performance improvement areas and help us deliver the kind of service that we want to, on a sustained basis. So with that I will open the microphone for questions. Thank you. We'll now begin the question and answer session. (Operator Instructions) The first question today is coming from the line of Justin Long with Stephens. Please proceed with your question. So I wanted to start with a question on the OR guidance for 2021 and I wanted to see if there was any color you could provide on the cadence of margin improvement that you're expecting over the next three years. Is it going to be a consistent pace or more front-end loaded and then along those lines, how much of this improvement is a function of PSR implementation versus operating leverage in the business with volume growth? Yeah, Justin. This is Mike. Let me take a quick stab at that. You know, obviously the guidance implies somewhere around 100 to 150 basis point improvement in OR. We think we still have one major headwind going into 2019. And those are the incremental PTC expenses, which are about $17 million. We're very early in the process here of identifying initiatives to reduce expenses, so I would probably guide you to maybe an acceleration as we get into '20 and '21, and you get the full-year benefit of some of those initiatives. So hopefully that helps . That does and also wanted to ask about the headcount assumption that's embedded in that long-term guidance, I think you said this year, up slightly, but how do you expect headcount to trend in 2020 and 2021? Well, I think with volume growth that we're expecting this year, we would typically see a little bit of increase in variable headcount to move that traffic. But again I think Jeff mentioned it and I made a comment on it. We would expect to continue to gain labor efficiencies. Jeff gave some pretty good examples and we're just so early in the process that we're not really fully baking in all of those potential opportunities, we'll continue to do that as we move throughout the process, but expect us to try to manage headcount is judiciously as we can. Thanks. Good morning. Wanted to sort of pick up where we left off there. Just sort of coming down to the EPS line. So obviously a CAGR achieved (ph) 2021 based on, Michael, and some of the things you're talking about there, should we assume that maybe we are on the lower end, sort of, early in the process or maybe '19 is on the lower end of that CAGR, just want to get a sense of, I think, how you think about it as it dropped down to the bottom line, because it sounds like there's some incremental expenses to think about this year? Yeah, Chris, this is Mike again. I think that's a safe assumption, again I'd point to the step up in PTC expenses as we are now in service on our entire network. So you're going to have a little bit of further benefit as you get into '20 and '21. So I think it's probably a reasonable for you to model it that way. Okay. Okay, that's helpful. And then I guess I wanted to maybe get a sense of CapEx profile. So if you don't elevate it here in 2019 as you bring some new locomotives on to the network and then as a sort of step down below 20%. As we've seen PSR implemented for some of the other railroads. There's been a really meaningful drawdown in capital spending as a lot of assets gets hurt. How should we think about it, is the potential for a little bit further of a step down, or what is the dynamic that might keep you from say at mid-teens to an upper-teens on a percent of revenue for CapEx? Yes, this is Jeff. I will talk about that, maybe the locomotive purchase I think I can explain kind of the rationale around that and promoting more high horsepower units as we transition all that, we will look to continue to park or divest some of our older yard locomotives. I think in general other maintenance such as engineering and maintenance away. I think those things remain pretty much in line and pretty much steady state. I think the difference probably remains to be other growth opportunities, be it capital investments in various refined products, opportunities or similar that I think we're leaving ourselves some room to continue to look at how we invest and play in that space, more from a growth capacity type scenario. Okay, so probably won't see that sort of mid-teens is probably fair to say that, that might be a little bit ambitious because of the opportunities you have on the top line. I think that's right, Chris. Okay , thanks very much, appreciate it. The next question is from the line of Amit Mehrotra with Deutsche Bank. Please proceed with your question. Excuse me. Thanks, good morning. So, the Company has put out long-term guidance in the past that has not been met and even more recently, the volume expectations have not come in nearly as expected, but you could just help us like what's different this time. You have this 2021 project there, what's different in terms of accountability or whether it's conservatism in the planning in terms of how you roll up to the 60 to 61 OR. I think that would just be helpful, because a lot of the conversations I have, it's really some sort of long-term targets, maybe met with some skepticism, is I think would be helpful to just put some context around, how you get there and what the robustness of conservatism that you baked into the plan? Amit, this is Mike. I guess the prior guidance that you referred to, I think what we predominantly missed with that guidance was the energy sector meltdown that we saw in ' 15 and '16, that seem to be the source of mess (ph) that we had. In terms of commitment to those numbers and what we have at stake, these are all numbers that are tied to our incentive compensation plans. And as you saw in some of the slides in 2018, we didn't meet those expectations and therefore we had lowered incentive compensation. So, we're all in on these targets and that will be tied to our incentive plans this compensation committee of the Board of Directors will hold us accountable for. I'll just say we've completed. As I mentioned at the beginning, we've completed our 2019 budgeting process and and update of our 3-year plan that, as Mike mentioned, is going to be the basis of our incentive comp targets and this plan is just based on the best information that we have available at this time. Feedback from customers as we learned in the energy situation that Mike referred to in 2014, 2015. That was also the case. I mean we met with our largest crude oil shippers in January of, I guess, it was 2015, with them in the eye and asked them are you serious about this, this is really what you're planning to move and they said yes, and we built that into our plan and built that into our guidance expectations and it proved to be wrong. So, we're always going to have risk in our plan and in the guidance, but we have sanity check. This is thoroughly as we can. We've had tight dialogue with our major customers to elevate our visibility into the revenue and volume side, and so we feel that this is grounded in reality and based on the best available information that we have at this time. Okay. No, I appreciate you entertaining that question, I know it's bit, a little bit of, maybe a tough question, but I appreciate that. One with respect to the PSR and I was wondering if you could just help us think about what part of the network are you guys going to attack or address first, when Union Pacific did it, it addresses kind of mid American network where a lot of the frac sand was moving through and obviously, volumes are going down there. Any part of the network that you may actually attack or address first either through pilot programs or just all in. Maybe you would have of the volume, could give us any color there, I think, would be helpful? Yeah. This is Jeff. I will try to provide a couple tangible examples of -- I will say some lower hanging fruit we've already identified. I think as we look at this, the Mexico network just due to the complexity or of our Intermodal manifest, you look at train length, you look at service design, in Mexico probably more specifically related to some of these PSR opportunities and I think that's where we're really kind of setting the site is, that's our priority from a service design perspective and a train start rationalization. As we've seen and continue to work with customers in the Monterrey area as an example, we've made some good strides climbing out of the congestion here, but also taking that further and we've been able to rationalize some of the equipment directly out of that terminal, working closely with those customers. So in the area of train start that will be, that will be our focus Intermodal manifest product in Mexico more strategically. The locomotive arena, I've touched on. So as train starts to rationalize, locomotives should follow suit in the crews, and the headcount start following suit as well. So as we embark on in the first inning here, I think that's where we see the initial work ongoing and starting to provide the most, I think, quick benefit. And Mike, is there any change in the pro forma leverage target for the company, as you think about capital structure or no? No. Nothing that we've officially provided as you know, we're in the low 2s right now. We were very focused on getting that final upgrade to BBB flat and that occurred in the month of October. And we feel pretty good about the balance sheet right now. I think it gives us a fair bit of flexibility. Okay, thanks so much guys, best of luck in the PSR invitation, appreciate it. Yeah, I just wanted to follow up a little bit on the PSR conversation. Can you talk a little bit about how long you've been working with the gentleman from CNN Consulting arrangement and how particularly he is incentivizing what is desirable outcome would be over this time-frame? And just operationally around that, could you just remind everyone, the percentage of your business that either originates and is terminated on your network versus the carriers that you, you partner with to either originate or terminate shipments? Thank you. All right. This is Pat. I'll take that one. And then maybe ask Jeff to chime in with the little color commentary. First of all, we're not going to get any more specific about the compensation or the arrangement that we have with Sameh other than to say that his performance objectives are very much aligned with the -- with mine, all of us around the table, the executive management team in terms of long-term performance targets. We started working with them actually in December and he spent quite a bit of time both here in Kansas City and down in Monterrey, engaging with the team, fully kind of a lot of information sharing, a lot of idea generation and then we kind of formalize the arrangement here just a couple of weeks ago. But as I said in my comments, I said in on, not all of those meetings, but many of them. And I think the level of engagement and he would -- I asked them this question just yesterday, how does he feel about the engagement of the team, not just the executive team, but down into the organization, and I think he is very pleased with the enthusiasm and excitement, the way this has been embraced. And let's say that everybody, everybody in this company knows that we can do better. As I said in my comments, we had a pretty decent quarter and pretty decent year, but none of us are very satisfied with it because we know we can do better. So I think the level of engagement is very high. And I'm very optimistic that we're going to see some very tangible -- we already have, tangible things that are going to help us get better and drive toward operational performance improvement and sustainability. As far as your question about interchange, there's a belief out there. I know some people have written that maybe PSR doesn't apply to us because of our size and because of the magnitude of our interchange. We don't believe that, but we really want to focus on the messages that we are going to adopt and implement principles of PSR that we think are most applicable to our network. And I think there are a lot of them to do. So a lot of this is just about discipline focus, accountability, all of those kinds of things will certainly apply and we will embrace and implement those things. But the other factor is if all of the other railroads that we interchange with, are adopting and implementing certain principles their own version of this, then it's -- it makes sense that we need to be aware of and be prepared to engage with our interchange partners differently. And as the result of their effort is more consistent and reliable service to us at the point of interchange. Then it kind of follows that we will benefit from the work that the other railroads are doing in this regard as well. I also think it's important to point out and realize that the recent management change at Union Pacific, which is our largest interchange partner, particularly at the border. Jim Vena and Sameh worked together side by side, on the same executive team for a dozen years or more. So I think the level of coordination and communication that we'll have with UP is, as they continue to implement their own version of PSR will be enhanced. Our next question is from the line of Tom Wadewitz with UBS. Please proceed with your question. Yeah. Great. Good morning. I know we're hitting a lot on this topic Pat, so I appreciate your patience. But it's a big topic. So I guess just further to the kind of role of Sameh and how you think about, I guess outside resource and how important that is to your PSR initiative. I mean, should we view him as essentially -- he is a consultant, but he is essentially full time at KSU for the next year -- the next two years. Maybe just a thought on that. And then is it helpful to bring in additional people to kind of help with the -- not necessarily at high level. But just to help with cultured teams that typically associated with some of the PSR initiatives. So I guess that just some more on the PSR? I think Sameh will be with us, unless something unexpected happens for two years. The incentive structure that we've put together, has a two-year measurement period on it. He will not be full time. I know he's got some other commitments and other activities unrelated to us, but I don't worry that we will not have his full attention. I'm pretty sure that even when he's not here, he's going to be engaged in communicating with the team and thinking about things that we're doing here. And as far as your second question, we'll just have to see, I didn't know, if we get the kind of engagement and momentum that we're all hoping we get and sort of transfer some of the knowledge that Sameh has from his 20 plus years of experience implementing this, then we may not need additional outside resources, but we'll just have to gauge that as we move along and see how the team engages. Yeah, that's great. I guess just for the quick follow-on, if I can. On multi-year OR target, can you give a quick thought on volume sensitivity to that, you gave us the volume view for '19 in OR target to 2021. I mean is it, is that a good OR target. Even if you hit kind of flatter volumes in out years or do you kind of need the '19 framework to continue in 2021 to hit the OR target, and thanks for the time? Well, Tom, this is Mike. Obviously volume is an important part of the equation in improving OR and as we look back on 2018, we didn't generate that volume growth. Some of it because of the shutdown of the coal facility, but other areas, we just didn't deliver. And so we do have an assumption in that 3-year period that we are going to see volume increase consistent with what we've always suggested, we were able to do and we do have some outsize growth areas that we think will allow us to generate that kind of volume growth. What's unknown right now is just how much cost we are able to take out over the next few years and that will become a little bit more important --visible to us as we proceed down this path. And now I would like to thank that maybe we get into mid year and have some better targets around cost reduction. So you may have a couple of offsetting items there, but the plan definitely looks to volume growth to help deliver some of that margin improvement. Okay, thanks for the time. Our next question is from the line of Matt Reustle with Goldman Sachs. Please proceed with your question. Thanks for taking the question. Just a follow-up on the OR target that you did provide, it's a bit lighter than what some of your peers have laid out and what some of the peers have achieved. Is that just being conservative because you are at the early stages of analysis or is there something about the network or your focus on growth that keeps you from guiding to sub 60? I think it's a bit conservative and reflects that we're pretty early on in perhaps some more aggressive improvements that might come out of the efforts here in the next few months. But it's pretty much in line, maybe a little bit higher, but pretty much in line with our peers. Okay. Yep, that makes sense and you already mentioned that UMP implementing PSR interchange partners in planning PSR, are you seeing any impact today, any issues with service today as they go through that process? Yes. this is Jeff, we're not really seeing any difference as of yet in service, I think again the opportunity will continue to have to work, primarily with Union Pacific with now joint kind of goals on streamlining, train starts, train length initiatives. Again, I see this as a positive as opposed to a negative necessarily on any changes that other interconnecting carriers may embark on. Our next question is from the line of Allison Landry with Credit Suisse. Please proceed with your question. This is Sam Yellenand on for Allison Landry. Thanks for taking my question. You've spoken about working with customers to create more efficient unloading in order to improve car cycle times and fluidity, how does that fit in with the PSR implementation? This is Mike Naatz. I'll take that one. If you think about the process, you have to pick it up, have to transport it, you have to deliver it, Loading and unloading is critically important. If our assets sit too long at the customer origin or destination, those assets aren't turning. If we have to wait for customers to load or unload that's going to cause a disruption in the network. We believe that our customers will participate with us and many of them have already started to participate with us in terms of improving their loading and unloading times. It's going to work to everybody's benefit and improved service of everybody does their share of the work and does it on time. It should also going to result in reducing congestion at some of the yards, improving the way we can operate for other customers and improving the overall velocity performance of our equipment, our locomotives or crews everything, so it ties in very nicely. Okay. And then given that volumes came in later-than-expected in 2018, what gives you confidence in the 3% to 4% range? As I said earlier, just we know we could have done better than what we did in 2018 because of service and then we talked about some of the, the unexpected or the impact of customer specific events like the coal customers. So if you set that aside, you believe that our service recovery is well on its way to being fixed kind of back to normal and then further improvement and then feedback that we have gotten from customers and really analyzing these opportunities gives us a high degree of conviction that if we can sustain a higher level of service and operating excellence, and the customers continue to invest in the facilities that they're building. We think we've got pretty good visibility into what the volume growth outlook will be. Thank you. And next question is from the line of Brian Ossenbeck of JP Morgan. Please proceed with your question. Hey, good morning. Thanks for taking my questions. Just wanted to focus on volume for a second, and specifically the Mexico energy reform opportunity. Can you give us a sense of what's in your expectations relative to 2018 and more specifically you've seen lot of headlines with AMLO and the administration that in, fuel theft, causing shortages. Is that an opportunity to actually import more cross-border or you sort of constrained by the infrastructure for the time being? Yes and yes, it is an opportunity. I will tell you and Jose has shown on the phone here, but we've had a very high level of engagement with very senior Cabinet-level officials in Mexico, talking about developing a more of a longer-term sustainable rail strategy for moving refined products. So we don't know exactly how that's going to play out, but if there was infrastructure available for loading storage trans-loading, there was more infrastructure available in Mexico. We would be moving more product than we are today. So there is an opportunity and I saw just yesterday that there have been some customs changes to facilitate and streamline the movement of refined products from the U.S. into Mexico. So, we feel very good about that opportunity. Don't have a good answer to your question about what's the upside? How much more could be moved? Because we're literally in the middle of those conversations with, particularly with the government as we speak. Mike, if you have anything to add to that. I think there is certainly some uncertainty in that space. However, we are very much engaged. I mean, AMLO made it clear that, how Mexico intends to compete in the marketplace and our perspective is that KC will serve Mexico's needs, whether that comes domestically or across the border. Okay. And then one more on the guidance of 3 to 4. You've talked about Sasol a lot and you haven't really given anything specific, but at least seems like good news as there is, they might be seeing some production delays. They've postponed one of their own updates, so can you give us any sort of context as to how you're thinking about that, from a projection perspective in that 3 to 4 for next year? Thank you. Well, I think we are expecting strong growth in the plastics business unit with respect to Sasol, yes, we are aware that the plant is mechanically completed, but they're working through bringing that plant online and we're not expecting to receive any material shipments from them until late in the year and we don't expect that they will ramp up to full production probably until 2020. But we really can't speak for Sasol. Those are questions that are, our best to answer them, but that is what we are considering in our plan. Our next question is from the line of Ken Hoexter with Merrill Lynch. Please proceed with your question. Hey, good morning. I know you run on for a bit here, but I just want to say, Sameh is a great, --a great high OR addition to the team even as a consultant, but maybe Pat, just a little bit more on that, when you say certain principles, can you describe what it is relevant to your network and maybe what's not? I just want to understand when you say you're going to adapt certain parts of it, what should we expect? I think some of the examples that Jeff gave earlier, I'll ask Jeff to provide some more color, commentary on that. Yeah, certainly, you're -- for me -- hey, whose got to get a more consistent service product. I think we perform well, we saw last year, we didn't perform as well as we've historically or like to. So consistency is probably one of our keys and in doing so again trying to start rationalization, simplifying networks, total train starts, again working with customers on rightsizing equipment, taking some excess equipment off the system, all will allow us to kind of flow better and for me consistency is really what we're -- what we need to achieve here most. Other areas, we're touching a lot, I just mentioned a few, fueling, it's interesting to see, we have processes for fueling and I'll give one more detailed example of locomotive shutdown processing. We have technology that shuts down locomotives automatically. We have manual processes and just the experience or viewpoints from Sameh or from Hunter via PSR and things like that, is there. We do save some money on how we shutdown locomotives. However, we probably increase our locomotive failures upon start up. So making decisions based on more experience and kind of what Hunter's methodology has been throughout his career may shift us one way or the other on technologies or pieces such as that fueling. I mentioned locomotive fleet, how we're going to look at that, how we're going to right-size and have opportunities to look at locomotives and kind of right-sizing locomotive fleet's, equipment is another big one. So I think really what you're hearing from other PSR implementations, again I look across these segments and I don't see any of those that are really kind of applicable to our network in some form of fashion. Again, I think we do talk about the interchange as part of that, that we are different in terms of interchange. But again, the shared goals that we have to create more efficient interchange wherever maybe through Houston, certainly at the border, working with interchange partners better to improve fluidity, there is, is in everybody's mutual interest. I think one of the things I'm excited about is to see from the Union Pacific perspective with PSR kind of streamline inefficiencies through Houston. We know that that's for an industry, that's an important segment, an important geographical region for the rail industry that is, we can streamline and simplify operations collectively through areas like that. I think, we're all going to benefit. Ken, this is Mike, maybe just one other quick thought and Jeff kind of alluded to it earlier and Pat made a comment, but there's been a lot written or said about, do these principles apply to KCS because of our smaller network and obviously we're interchanging a lot of traffic with UP, but Mexico looks and feels a lot more like the other rails with originating and terminations on our own network there. So I think that gives us some additional confidence that we can gain a lot of leverage there. Appreciate that. I don't think anybody's ever questioned whether it would work. I think can't approve that at his first stop at. I see, but I guess I want to understand, Pat, as -- do you view this, I mean with Sameh as a part-time consultant. I was a bit surprised by that I mean, I think it would be a great addition to the team. But, as Tom mentioned before you typically see PSR as kind of a complete overhaul culture change. So do you see this more as a mechanical adoption and kind of as Jeff you were mentioning kind of doing piece parts versus a complete overhaul of culture change/employees, cutting CapEx, changing how customers behave. I just want understand is this incremental or is this kind of, I mean usually a PSR is kind of a shock to the system completely changed fundamentally how you operate? I think it's a bit more incremental in our case. And I just remind people that we're not coming -- going back to Hunter's experiences. We're not coming from kind of the distance to the pack in terms of operating ratio and performance. And I think if -- I'll even remind everyone, thinking the -- one of the conference calls that Hunter had when he was at Canadian Pacific, talking about his desire to acquire. I think this might have been Norfolk Southern, but a question was, was raised, what about if this doesn't work out, would you pivot to the Kansas City and one of the comments he made was, well, they run a pretty good railroad there. So I don't know that the magnitude of the change that we see is such that, that kind of as you refer to a culture shock, is necessary or appropriate. We've done a lot of work here internally with our employee base in U.S. and Mexico over the last couple of years about culture, principles, values accountabilities. I think all of this fits in with the work that we've done there. So I think it's much more of an incremental. We will do this in a manner that is consistent with the culture and values that we've been talking about with our employees for really the last couple of years. And so I think it is going to be a bit more incremental, which doesn't mean that it can't be pretty powerful in terms of the magnitude and the impact. And at the core, as Jeff mentioned, the core of all of this, is focus on service, serving our customers, yes, we will probably have some change management to do with customers as certain elements of this are rolled out, but getting our service to a level that is consistent, sustainable and allows us to realize the growth opportunities that we know are out there first. Appreciate all that. Thank you. Just a quick one, if I can, sneak one in, the autos, you mentioned a positive outlook, but it started off pretty negative, is that significant closings overall to start or anything, just a quick one on the auto thing? Sure, this is Mike. The number of the automotive manufacturers in Mexico we're going through plant shutdowns throughout the holiday. We got off to a slow start, two of those plants ended up taking a week longer to start up than we had expected and planned for. That's why we started a little bit soft, we are seeing recovery now as those plants come back online. Great, thanks for the time, guys. Appreciate it. The next question is from the line of Jason Seidl with Cowen and Company. Please proceed with your question. Thanks operator. Good morning, gentlemen. Looking at '19 in terms of your OR outlook, how much of your conservatism on occasion on the fact that two of your major interchange partners are, are implementing PSR and as you might be accepting some blow back in operations because of that? You are not going to really hear that. That was me knocking on the wood when you said that. This is Jeff again. I mentioned earlier, we haven't seen any, any material change either way with major interchange partners and I think again that the relationships that we have with UP remain strong. I think Sameh and his experience with Mr. Vena also we are going to help support that, and again, as we've talked, it's in our mutual best interest to run a more fluid network. And that depends on both -- kind of both sides or both partners whatever interchange partner we're working with, really looking at that and working together better on how we can streamline flows. If we're able to reduce train starts, straight longer trains to Houston complex, that's going to create better fluidity and help the overall network. Okay. That's understandable. Well, switching my next follow-up questions to Lazaro. You talked about your activity it was from volume and I know a lot of that came around sort of get back to some of the shippers because the -- the exchange rate was making it very unfavorable versus sort of the local factors down there. Can you talk about those give backs and the impacts on the reported pricing numbers and how that maybe would look exact? Sure. I'm happy to talk about that a bit. So we do have a rebate program in place targeted to grow traffic out of Lazaro into Mexico City. The concept is relatively simple. If the shippers hit their growth rates, then the rebate is applied accordingly. That rebate basically neutralizes the effect of some of the costing issues that we have that make us less competitive. These rebates are basically in operation while the exchange rates are greater than 17 pesos per U.S. dollar. So they do fluctuate depending on the value of the peso and if they don't -- if they don't hit their growth rates then no rebate is paid out. So we believe that it's making us competitive in the marketplace. And what sort of an impact -- what sort of an impact did that happen reported pricing? Okay. That clears it up. Gentlemen, I appreciate the time, as always. Thank you. Next question is from the line of Scott Group with Wolfe Research. Please proceed with your question. So are you guys implementing any of the assets story or demurrage changes and Intermodal lane closures like we've seen from NS and UP, this year? Yes, we are evaluating the rates that we provide or that we charge for services that we provide. So the answer is yes. We are evaluating at this stage. As far as intermodal lane closures, no, we haven't considered any of those. Scott, I think as we look at, again, our largest or kickoffs really opportunity for PSR as I mentioned, intermodal manifest, it's more of a probably consolidation of trains and as we look at train length and our ability to more merge or combine those types of traffic to reduce train starts as opposed to rationalizing an entire Intermodal lanes is just an example. And remember, Scott. We are in Intermodal business, is kind of in discrete categories, U.S. on the Meridian Speedway, we're a bridge carrier, that have cross-border network and in Lazaro, so there probably aren't huge opportunities to go walk away from segments of that business . Right. Makes sense. Okay. And then I want to just make sure I'm understanding sort of the message on this PSR path. So, as we've seen the other models play out, right, meaningful sort of 20% plus reductions or improvements in labor productivity meaningfully lower CapEx and loco's and step functions in OR, CSX, CP, 1000 basis points in two years, right. I get the message, right, it's early and we're not really sure exactly, but are these sorts of things in your mind in the realm of possibility or is it that hey our starting point in OR is better. We're doing a little will bit differently and don't get too carried away. I just wanted to show really understanding the message. I would say you your final comment there, we're starting from a different perspective than some of the other examples out there. So, we don't see all that, the magnitude of that sort of initial top is going to be the same in our case, as it was at a couple of the other railroads. And I know you've shied from this maybe a little bit in the past, but are you willing to say where the U.S. OR is, because I did -- I thought like historically that was closer to the 70 than low 60. So I would have thought there would be a big opportunity there. Scott, this is Mike. We're not going to go there. We've continued to make improvements in the U.S. and we'll continue to make improvements going forward, but we're going to stick to our consolidated business, our bread and butter, the cross-border and it takes both the sides of the U.S. and Mexico to generate the kind of profitability that we are. Makes sense. Thanks so much again..
That is truly how we manage the network. Thank you. Our final question this morning is from the line of Ivy Zhang with BMO. Please proceed with your question. Yes, good morning. Thanks for squeezing me in here. Just a couple of clarification, is there anything in the labor agreements in Mexico that might make the application of PSR like we've seen it elsewhere more difficult and the second question is just really clarification on your Slide 15 I think, that volume outlook slide, you say there is a risk through the crude outlook, the heavy crude outlook in 2019 due to Canadian crude production cuts. I was under the impression that, that these agreements for take or pay with volume commitment, is that not the case? Yes, but it's not the agreements provide compensation if there is the volume commitments or targets are not met, but they don't have to ship the product. So it could have an impact on our volumes, but there is a mechanism to recoup, particularly the capital investment that we've made to support that business. I mean, said in other way, the per car charge that will get for not moving the volume is less than the margin we would have received on the carload that would have moved full. I'll take that initial question on the labor, now that the outlook Mexico really doesn't prevent us from gaining efficiency certain labor productivity will probably go at it a little bit differently. We still have -- as we've talked about 3 and 4 person crews in the cabin some areas, so you might see target or you might see one time restructuring activities as we negotiate with labor to try to maybe gain efficiencies in those areas as opposed to just the other aforementioned activities on train start rationalizations. But, no, there's really nothing structurally different that would prevent us from rightsizing labor forces. Thank you. At this time, I will turn the floor back to Mr. Ottensmeyer for closing comments. Okay, thank you all very much for your time and attention. We will be active here in the next few weeks on the conference circuit and plan to provide updates and probably more details as we get further into this, so stay tuned to that and I think the only thing I can think of to say is, as we close out, go cheese (ph). We'll see you all in about 90 days. Thank you. Thank you, this concludes today's conference. You may disconnect your lines at this time. Thank you for your participation. David and Tom just revealed what they believe are the 10 best stocks for investors to buy right now... and Kansas City Southern wasn't one of them! That's right -- they think these 10 stocks are even better buys.